If you haven’t kept up with the world of smart products, along with smart watches and thermostats, you can now buy remote controlled coffee makers, Wi-Fi enabled egg trays and video chat hardware for your pets. The media lumps these types of products into the “smart” category, but whether it makes sense to connect everything in your home to the internet is debatable. Given the broad range of products being branded as “smart,” the word doesn’t have a clear or meaningful definition. In many cases it’s abused by marketers who want their products to be included in the Internet of Things (IoT) movement. For the purpose of this article, lets define smart products as those that connect to other products or services in a way that augments their functionality. Most smart products connect to a smartphone app or cloud based service, but some are capable of connecting to other products. As you can imagine, connecting something to the internet doesn’t magically make it smart. This is especially true when talking about automation. Not all smart products are designed for home automation purposes. Most smart products are just remote controlled and require commands to be issued from an app. By definition, automation products must have some level of autonomy and shouldn’t require constant interaction from the user. The rest of this article is focused on automation products and why context is such an important aspect of automation. In a broad sense, context is the circumstances that form the setting for an event that allow that event to be fully understood. In regards to home automation, context is the set of inputs required to automate a task. To illustrate this, lets compare an old school programmable thermostat to a Nest learning thermostat. Thermostats have a simple job: maintain the temperature of a room. If the temperature falls below the setpoint, or desired temperature, they enable the heating system. Once the temperature reaches the setpoint, they disable the heating system. The programmable thermostat has two inputs: the setpoint and the current temperature. In most cases, the user programs the setpoint at various times of day for each day of the week. The thermostat then monitors and compares the current temperature to the desired setpoint and acts accordingly. The Nest learning thermostat also allows the user to set a schedule, but has a few more inputs, such as occupancy and manual overrides. If the schedule says 72 degrees but the Nest doesn’t think anyone is home, it will lower the temperature automatically. If the schedule says 70 but every morning you turn it up to 74, the Nest will learn and adjust the schedule over time to mirror your preferences. Every task that can be automated has unique context requirements. Some need a single input while others need half a dozen. Some inputs are gathered automatically while others require physical interaction with a device or app. In a perfect world there would be no unnecessary physical interaction, but we’re not there yet. Utility automation has roots in large commercial settings where energy consumption can be incredibly expensive. Think 500,000 square foot industrial warehouses and manufacturing facilities. Building automation systems in these environments need custom installations and maintenance staff, but yield enough savings to offset the costs. In many cases, automation can save $0.20 to $0.40 per square foot in utility costs. Unless you live in a 50,000 square foot mansion, spending money on custom automation and maintenance staff is probably not a good investment. But, thanks to advances in wireless technology and falling hardware prices, you can automate many aspects of your home utilities without breaking the bank. Learning thermostats, timed lighting, smart water heaters and usage sensors can all be used to make your home more efficient and save you money. Compared to other types of tasks, utilities are simple to automate since they require very little context. House too warm? Cool it down. House too cold? Heat it up. Also, the rules that govern utility automation don’t change very often. There are inevitably ways to make utility automation better, but the low hanging fruit were all picked long ago. Home security and monitoring products have been around for ages and even though they’re found in the automation section, they don’t require much context. Monitoring often has a single input, such as motion, light, temperature, moisture, etc. Motion detected? Trigger an event. Light detected? Trigger an event. Security systems range from zero context to low context, depending on the number of sensors involved. Systems that simply film 24/7 have no context since they’re constantly filming. Walking past the camera, opening doors, turning on the lights, etc. have no effect on how the system behaves. Some systems only film when a sensor is triggered, such as a motion sensor or door sensor. The sensors give the system context and affect how it behaves. The problem with contextual security and monitoring systems is the risk of false negatives. If the system fails to detect an intruder and therefore doesn’t start filming, the negative impact could be substantial. Or worse, if a smoke detector fails to alert occupants of a fire, the failure could be deadly. For these reasons, security and monitoring systems should err on the side of safety and not depend on unreliable sources of context. Similar to utility automation, lighting automation has been around for a while. Until recently, the primary goal of lighting automation was cost savings. Timed lighting is an obvious solution because you probably don’t want your yard lights running at 2:00pm on a sunny day. By automating when various lights turn on and off, you can save a fair amount of electricity. Even though lighting is one of the most popular home automation products available, the automation aspect of it hasn’t advanced much. With Wi-Fi enabled bulbs and LEDs capable of displaying millions of colors, the potential for lighting automation is huge. 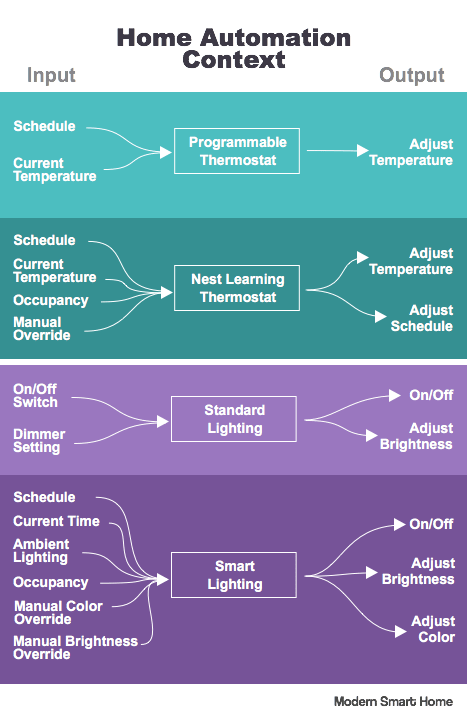 Now that the bulbs themselves are connected to the network, home lighting systems are capable of more contextual automation. Timed lighting has very simple inputs: the current time and a lighting schedule. Modern lighting systems are able to accept many more inputs: the current time, a lighting schedule, ambient light, which rooms are occupied, who is in each room, each person’s lighting preferences, manual color overrides, manual brightness overrides, etc. Unfortunately, though, these systems still require a lot of manual interaction via apps and physical switches to get the lighting just right. Not all context-based automation yields energy savings, but it is a step towards total automation. Imagine a world where there are no light switches or apps to control your lights. Each member of your family simply walks from room to room and the lights adjust accordingly. Your home gets it right 95% of the time, and the other 5% of the time you tell it what to change. The vision is to make your home lighting system anticipate your needs while being as low friction as possible. HVAC and lighting are a natural fit for home automation since they have a limited number of simple inputs, but companies are sticking sensors and Wi-Fi adapters into much more than just thermostats and light bulbs. As more complex tasks are automated, the need for reliable context becomes more important. Personalized automation requires a very important input: identity. Although identity is a single variable, accurately determining who is requesting or triggering an automated task is challenging. For low context automation like utilities, identity doesn’t matter. Keep energy costs low regardless of who is in the house. For other types of automation, though, identity is required. One popular identity dependent product is the smart lock. There are a number of smart locks on the market that claim to make entering your home easier. Most of them have Wi-Fi or Bluetooth connectivity to allow remote access from an app. Although locks don’t require much context, identifying who is using it reliably and accurately is crucial. Locks with physical keys have a single input: the key. Most smart locks provide a physical key, but the value they advertise comes from using a virtual key. Typically, virtual keys take the form of an app. You pair the app with your lock, configure it, then use the app for locking and unlocking. One benefit of smart locks is they’re aware of who is opening them, which is something a physical key can’t provide. This is helpful in recording who is using the lock and allows granular access control rules. The August lock, for example, allows temporary keys to be issued to guests, meaning no more keys under the welcome mat. Just like physical keys, virtual keys can be spoofed. If someone steals your phone or gains access to your virtual key in any way, they’ll be able to open the lock. Although convenient features like remote access and auto-unlock are nice, they expose a new attack surface that could be exploited in a number of ways. Just like other security products, access control products that depend on identity must be carefully designed to minimize risk. Coordinating multiple products to perform some task synchronously is becoming more practical as more products get connected to home networks. Each combination of actions can be viewed as a “scene.” You may have a theater scene where your lights dim, your entertainment center turns on, and your shades close. You may have a morning scene where your shades open, your lights get brighter, your coffee pot starts brewing and your favorite news station starts streaming. The level of context required to switch between scenes depends on how the scenes were configured. If the scenes are predefined and must be switched manually, not much context is required. But, if your home can automatically switch between scenes based on time of day, who’s in the house, the weather, etc., much more context is required. If you’re taking the day off, you don’t want your lights to turn on at 6:00am. If you’re on vacation, you don’t want your coffee pot to start brewing every morning. For all these products and relationships to be automated, your system needs to have reliable context. So why does context matter in home automation? Because automating anything more than a thermostat requires careful coordination of accurate inputs. Context enables reliable, secure, personalized and useful automation. Let’s move past remote controlled toasters and start building useful systems that not only save us money, but make our lives easier and more enjoyable. At Modern Smart Home, we’re interested in how to achieve reliable context. Context is a building block for automation and something we’d like to see more products focus on. Subscribe to our newsletter or like us on Facebook for more home automation analysis and the latest on context focused products.